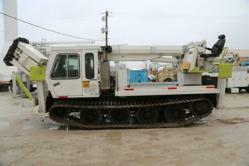 I-80 Equipment is now offering a rare 1999 Bombardier GT2000 HYNT All Terrain Truck Digger. This fully reconditioned digger truck is available for a limited time at 1/3rd of the original sales price. I-80 Equipment of Colona, IL is now offering a rare 1999 Bombardier GT2000 HYNT All Terrain Truck Digger at a deeply discounted rate off of the original sale price. The all terrain vehicle is normally listed between $470,000 and $500,000 is currently being sold for $161,000 by I-80 Equipment. This 1999 Bombardier is fully reconditioned to a like-new state. All drive pumps will be checked and in fully operational order. This new addition, the 1999 Bombardier is equipped with full wireless remote controls. This incredible safety feature allows operators to remotely operate all booms from off of the truck. In addition to the wireless remote controls, the Bombardier is equipped with a pin-on bucket allowing this digger truck to do the work of two trucks. The upper single man bucket allows users to service poles after the poles have been installed. This truck is equipped with an additional 15’ personal jib for lifting lighter materials. The jib can support up to 4,000lb. The Altec boom that this truck is outfitted with has a 24,000lb lifting capacity. The 1999 Bombardier GT2000 HYNT is an all terrain vehicle that moves effortlessly through heavy snow and marshes. In off road locations where regular trucks would easily get stuck, the Bombardier travels easily. These Bombardiers are solely manufactured in Canada and are shipped to the United States where they are outfitted with booms and outriggers. This particular model is a rare find at 35 percent of the original cost. Customers can view a full video and photo gallery at http://www.i80equipment.com/digger-trucks.shtml or contact I-80 Equipment to speak with a sales representative about this rare 1999 Bombardier GT2000 HYNT All Terrain Truck Digger.